Complete with two easy rocking chairs and a tasteful glass top table, the bistro set is a great addition to any indoor or outdoor space. The rattan frame is crafted of high quality PE rattan material and coated in a weather resistant finish that can endure all types of weather for years to come. Four plush foam cushions with removable covers are designed for optimum comfort and easy cleaning. 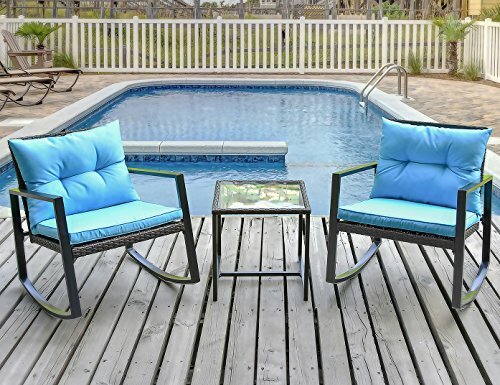 Put the bistro set in you patio, duck or poolside, rock away all the stress and treat yourself to blissful relaxation. Notice: Manual measurement has been used, there may be some reasonable error. If you have any questions about this product by Leisure Zone, contact us by completing and submitting the form below. If you are looking for a specif part number, please include it with your message.